The newly set-up unit of Lumax Auto Technologies situated at Aurangabad has started commercial production / supply from February 12, 2019. The unit has been set-up to manufacture and supply chassis frame, swing arm and trail arm for Bajaj Auto. The company made the announcement on Tuesday, post market hours. "The unit has been setup with a capacity of about 700,000 annually. The unit was inaugurated by Mr. D.V. Rangnath, Sr. Vice President – Materials, Bajaj Auto Limited and Mr. Anmol Jain, Managing Director of the Company", metioned the company in the excgange filing. Lumax DK Auto Industries is engaged in the manufacture of lighting modules and integrated plastic molds. 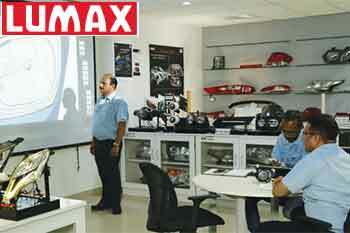 Lumax Auto Technologies Ltd is currently trading at Rs142 up by Rs3.55 or 2.56% from its previous closing of Rs138.45 on the BSE. The scrip opened at Rs142 and has touched a high and low of Rs142 and Rs141.95 respectively. So far 7,493 (NSE+BSE) shares were traded on the counter.